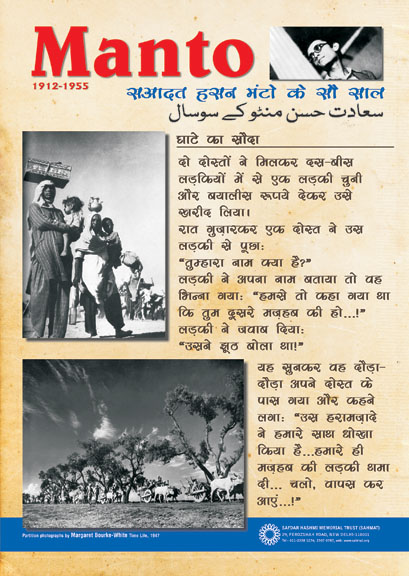 Sadaat Hasan Manto wrote searing fiction about India. His short stories make up a double-edged legacy all of us share, whether we read the stories in the original or in translation. Manto’s stories were about a nation-in-the-making, but they force us to confront the “ideas of India” battling in the already-made nation, now more than ever. 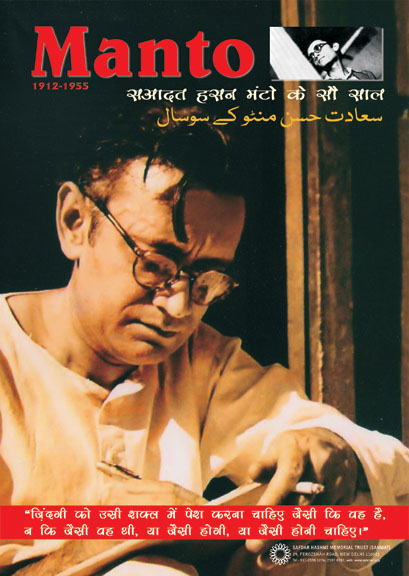 Manto was also a film and radio scriptwriter and a journalist – he did not live in a writerly ivory tower. He was very much a man of the real world, of the streets of his city and country. He was a thinking man of his times, driven to anguish by the partition that killed, raped and looted; destroyed lives, homes, histories and roots; and stained almost every aspect of what makes people human. It wasn’t just visible upheaval Manto reacted to. He was equally concerned with hidden tumult, both in the minds of actors of violence and of those acted upon. An English translation of his story “Mishtake” provides a sharp illustration. Here, in a few graphic lines, Manto captures communal prejudice, and the hatred and violence it breeds. Here’s the division and heartbreak communalism creates; not just in the minds and hearts of the “subjects” – whoever happens to be the “victim” of the moment – but in the perpetrator’s psyche. The Kannada critic and cultural commentator D.R. Nagaraj wrote, with great insight, that you can get to know a society through its metaphors: “To read fiction is to know the fate of a society through its metaphors.”2 In Manto’s apparently small story, the metaphor of the story is also the metaphor of a society. This double-role metaphor is a big, bloody, fatal mistake. A mistake in history that can never be undone; a mistake that has multiplied itself so it is replayed in the present; a mistake that hangs darkly between us and the future. This many-armed mistake will live as long as the ideology that moves that knife across “different” skin flourishes. But the word “society” seems to have lost much of its power; it has become a somewhat comfortable abstraction. We criticise “society” or even the “system” quite easily – they seem, in practice, only to include everyone else, not the self. What about the word “nation” then? The word “India”? India – the idea of India, my idea of India, yours, theirs – is still sharply contested territory. All of us are on the battlefield, part of the struggle to name this thing called India, describe the nation we are part of, that belongs to us, and that we belong to. It’s hard to be too detached from home. How then do we look at our home, our nation and, most of all, this act of simultaneous inclusion and exclusion, through Manto’s stories? Like “Mishtake”, “Khol Do” is a communal battle fought on an individual body. But here the battle for dominance takes place on the site of the female body. “Khol Do” contains more irony, more suffering, than it would seem possible within the confines of a short story. It is set in the riot-torn times of partition, when life meant surviving trains full of bodies, some dead, some half-alive; refugee camps; and a constant sense of menace, with danger or death round the corner. In the story “Khol Do”, Sirajuddin runs with his daughter Sakina to escape the rioters. Sakina’s mother has begged her husband to let her die –her entrails are already hanging out – and save their daughter. As they run, Sakina’s dupatta falls, and her father tries to retrieve it. Let it be, she screams, then he loses her, though he has the dupatta. In the refugee camp he is in, he tries desperately to find her, then asks a band of “social workers” to help. They find her, but they don’t rescue her; she is raped; and Sirajuddin finally finds her in a hospital. At this point, the story forces him, and all of us, to name the unnameable damage a combination of communal and gender violence is capable of. The object of the violence between man and man, and, as collateral damage almost, the violence between men and women, is for Sakina to be completely subdued. To hand over possession of her body, and the territory of self, to men – not just the men who raped her, but all men. This is the chilling suggestion of the story: when men fight their battles of hatred on the site of a female body, even the father becomes just another man. A man she has to open herself up to, untie her pyjama strings for. The world is divided and subdivided, into religious communities, into men and women, into attacker and attacked. And so upside down is such a world, that not only do we have to take in her response – pulling down her salwar for any man, even her father; but also the fact that Sakina’s father does not see what she is doing. All he sees, joyfully, is that she is still alive. Violence against women in general, and violence against women of certain castes, communities, tribes and classes, continues in our India all these decades later. Sakina’s ravaged body and Sirajuddin’s ravaged mind are not yet memories. The story “Socialism” moves from this perennial site of conflict in the nation – then and now – to another. The mob is greedy, but this time the mob is correct. All these years later, we recognise the man. We can update the make of the truck and the nature of the personal belongings. But the man is the same; so is his protest about the sanctity of personal property; and so is the “scary” mob that is telling the truth about him. In fact, the word “mob” could, arguably, be replaced with “crowd”. This crowd, perhaps on its way to becoming a mob, is still speaking for the “masses”. At any rate, Manto knew his crowds, masses, mobs, and all the in-between versions. He knew the open and hidden transactions that take place across classes. Then there’s Manto’s masterpiece, “Toba Tek Singh”, which pulls us back to the nation, our idea of India, and our daily struggles with both old and new manmade borders. If Saadat Hasan Manto were alive today, would he write his story “Toba Tek Singh”? He would probably write it again, word for word. In a writer’s world, history is not an extraneous, “objective” outside force. History is not abstract or official. It lives, it is capable of pain and suffering, it can bleed. History takes on the shape and skin of people, their unofficial and unheard thoughts, fears, hopes. History is in the girl who is raped so often she pulls down her salwar and spreads her legs like a zombie even though it is her distraught father who has come to see her. In the man who realises, but only after he has committed murder, that he has made a “mishtake” because his victim belongs to his own community. In the mad man Toba Tek Singh, who prefers to die in a no man’s land to living in a country where borders can spring up overnight. 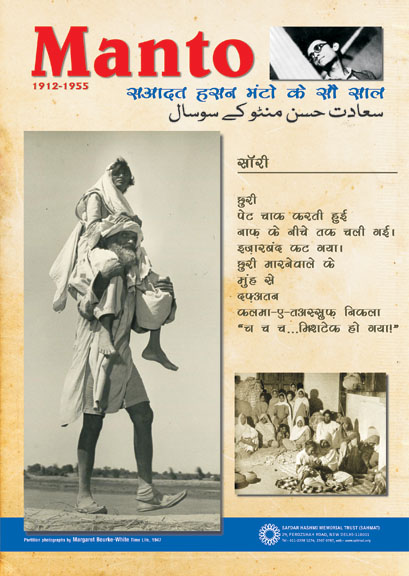 “Toba Tek Singh” is set two or three years after partition; it was first published in 1955. But the story speaks to us like today’s news, its pain and truth not blunted by the years. All these years later, Toba Tek Singh, like his creator, lives. If he stood at Wagah Border today, between the gates of India and Pakistan, we would understand every mad word he says. Why? The story of partition is not the story of a moment because it does not stop at 1947. It is part of the subcontinent’s stories of exile, movement and resettlement. The story “Toba Tek Singh” does this by first insisting that places have to be named. Names explain places, what they are and how they came to be. And a new place that suddenly unfolds before you so your next step may take you into it has to be named. How else will you begin to know it? His answer, the definition of a nation on the basis of religious identity by a lunatic, may still need to be decoded on both sides of the border. The question “What is Pakistan” also alerts us to the fact that like traditions and works of art, nations are created, imagined, then built and consolidated. “The geography of the nation is not so much territorial as imaginative…”7 Governments, official bodies, draw the borders; people have to imagine the nation into being. The idea of watan is not just a house, or a country or a land; it is a sense of place, of belonging, of rootedness. This sense means imagining a collective – a nation – while keeping alive difference and diversity. If they were in India, where on earth was Pakistan? And if they were in Pakistan, then how come that until only the other day it was India? Confronted by the human (or philosophical) dimensions of naming but also the politics of naming, one lunatic climbs a tree and says he does not want to live in either India or Pakistan but in that tree. The hero of the story is an unlikely hero called Bishan Singh. But the times are so uncertain that even the names of people don’t stay fixed. Bishan Singh comes to be known by a name that leaps from the metaphor of naming places in times of violent change to that of naming people in the throes of dislocation. Bishan Singh is called Toba Tek Singh, the name of the village he comes from; a village significant only because no one is quite sure where it is – in India or Pakistan. The narrative moves on from names – a word or two – to a whole sentence, a paragraph, a language. What language can express the madness of borders becoming more important than people? Of borders taking over people’s homes, families, past and future? Toba Tek Singh speaks in variations of a secret formula: “Uper the gur gur the annexe the be dhyana the mung the dal of the Pakistan and Hindustan dur fittey moun.” His “nonsense language” articulates the madness, the incomprehensibility, of what he is living through. If we probe the language metaphor, we find some vexing layers of meaning. The story – and real life – lead a “bilingual” existence. Both government-speak and human-speak– what should be citizen-speak– are part of life. But only government-speak seems to make literal sense, though it does not make actual sense; that is, it is essentially meaningless in human terms. (Parenthetically, we must remember that it is this official language that will create and disseminate “the vocabulary of the nation”). And human-speak, when not allowed to be citizen-speak, becomes lunatic-speak. The incredible irony of “Toba Tek Singh” is that it is his lunatic-speak that yields the meaning of the story to us. So both uncertainty and hatred hang poisonously in the air in Manto’s story, a story where language itself is rendered insane by the disturbing questions raised. Even as the nation is created, and its language tested out, its narrative is challenged. The story seems to be asking us some basic questions about the formation of the modern nation state: is it imposed “from above”? Are the human constituents of the nation accidental constituents, kept in the dark about what they are to think of as their country and their home? To which they must commit loyalty, maintain a bond of love? Such questions create an impasse in the story, and in the real life of making nations and borders. What “resolution” does the story offer? In real life, the search for resolution continues, whether it is between “us and them” as in India and Pakistan; or “us and them” as in the borders being drawn within India day after day. Manto lives, because we still cannot confine his words, his fiction, to the safety of a museum, a library; or to what was true, but is now past. Manto lives in 2015 because his fiction still holds up a faithful mirror to the India we live in today. 1. Translated by Khalid Hasan for Mottled Dawn, Fifty Sketches and Stories of Partition, Penguin India, 2004. 2. Introduction to Kannada section in A Southern Harvest, ed. Githa Hariharan, Katha Regional Fiction, Katha-Pupa, 1993. 3. Introduction to Women Writing in India, Volume 2, eds. Susie Tharu and K. Lalitha, OUP, 1994. 4. Translated by Alok Bhalla. 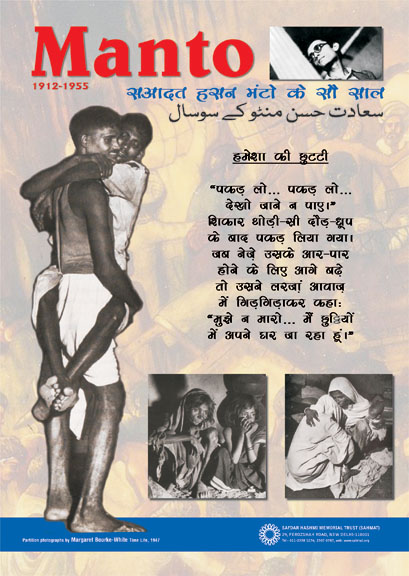 See https://zjeddy.wordpress.com/2012/05/11/thanda-gosht-by-saadat-hasan-manto/. 5. Translated by Khalid Hasan, 2004. 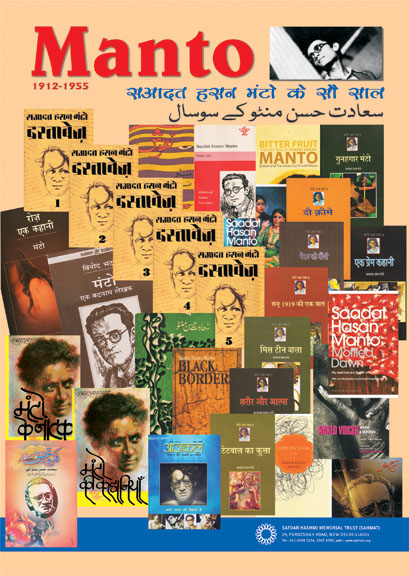 See http://indiauncut.blogspot.in/2006/10/saadat-hasan-manto-and-socialism.html. 6. Translated by Frances W. Pritchett. 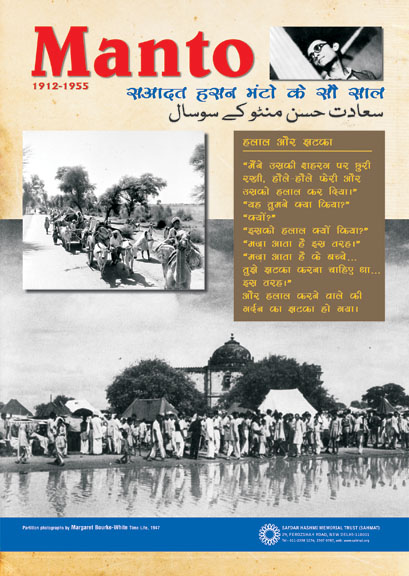 See http://www.columbia.edu/itc/mealac/pritchett/00urdu/tobateksingh/translation.html. 7. Tharu and Lalitha, 1994. © Essay Githa Hariharan; ©Images, SAHMAT.